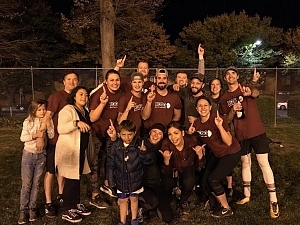 "Sweep the Leg" is our Fall Downtown Division champion, once again proving that they are the top kickball team. At 10-0 they finish the season undefeated, picking up a +44 point differential on the way. While "Sweep the Leg" finished a perfect 10-0, they did have a few tough games en route to the title. That included a close 4-3 win to start the season, which is a bit uncharacteristic on their part. Normally "Sweep the Leg" is firing on all cylinders right out of the gate, but this season it was more of a rolling start. They also edged out the "Unstoppable Golden Geese" in a 3-2 victory midway through the season. In the playoffs that trend continued. After a 1st round 6-1 win over "Guac N' Roll", our champs found themselves locked in a pitcher's duel. But, as was expected, they'd find a way to win it, taking home another title after the 1-0 shutout. Congratulations to "Sweep the Leg" on the championship! 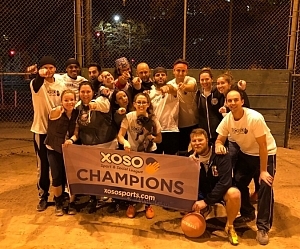 "Kick Deez" is our Fall Midtown Division champion, cruising to victory in their 2 playoff games. First they blew out #4 "New Kicks on the Block" 10-0, followed by a strong 6-1 title game win over "We've Got the Runs". In all they finish with a 9-1 record, along with a league best +36 point differential. For comparison, the #2 team in the division (their championship game opponent) finished with a +11. Basically, the rest of the league wasn't even in the same ballpark! 1-run games were the name of the game for "Kick Deez", playing in 5 of them through the season. That includes three straight to start the season, all resulting in wins. Near the end of the season our champs hit a bump in the road, dropping their first and only game of the season in a 4-3 loss to "New Kicks on the Block". Our champs got the last laugh there though, blowing them out in the first round of the playoffs. Congratulations to "Kick Deez" on the incredible title run!